Best Buy joined forces with Israel-based telehealth company TytoCare to offer TytoHome devices exclusively on Best Buy's website and in select stores in Minnesota. TytoCare partners with first major retailer, Best Buy, who has identified health as a key growth focus. Oschsner Health System partnered with Tytocare to offer patients access to a remote patient examination device developed for virtual appointments. Prime Minister Benjamin Netanyahu and Brazilian President Jair Bolsonaro were presented with various Israeli developments in the fields of agriculture and health, one of which included TytoCare. Tjarks was named Sanford Health's Innovator of the Year during a March 1 banquet in Sioux Falls. His latest project has been implementing TytoCare into his Mitchell practice. Netanyahu and Brazilian President visit Israeli innovation exhibition, meet Israeli and Brazilian businesspeople. TytoCare presented their device at the innovation exhibition. The healthcare industry is expected to see virtual care demand outpace ambulatory care volumes by 2020, according to a Forrester report. See a full list of virtual care companies, including Tyto, who are shaping this growing industry. Vidyo, a provider of real-time video solutions, is integrating its VidyoConnect telemedicine video conferencing solution with the Tyto Care's remote examination device. Come visit Tyto Care at the American Telemedicine Association 2019 annual conference and expo, held April 14-16 at the Ernest N. Morial Convention Center in New Orleans, LA. Stop by booth 513 to see a live demo and to hear what's new with Tyto – we hope to see you there! Medgadget spoke with Ophir Lotan, VP of Product and Implementation at Tyto Care, on the history and capabilities of Tyto products. Tyto Care extends its Series C funding round to include strategic investors Sanford Health, Itochu, and Shenzhen Capital Group, bringing the total funds raised to $33.5M. Tyto Care, an innovative telehealth company enabling live telehealth visits and comprehensive medical examinations, today announced that it has closed $9M in additional funding from strategic investors including Sanford Health, Itochu and Shenzhen Capital Group (and its affiliates). The additional funding is an expansion of Tyto Care’s quickly oversubscribed 2018 round led by Ping An Global Voyager Fund, leading Tyto to extend the round to include new strategic investors. This brings the total funds raised in Series C to $33.5M. Nicholas Thompson, WIRED Editor-in-Chief, presents TytoCare as one of WIRED's Best of CES 2019 innovations, highlighting Tyto's ability to spare parents and sick children a trip to the doctor's office with its on-demand, at-home examinations. AFTER WALKING MILES of expo hall carpeting, watching countless live demos, and sitting through god knows how many press announcements, we're ready to declare these 10 products to be the best things we saw at CES 2019. Of all the amazing and beautiful gadgets on display here in Las Vegas, these are the products which exhibit a strong sense of innovation and vision within their categories. LOOKING FOR LIVE updates from CES? Find our Wednesday liveblog here. Also be sure to check out our photo galleries filled with the best things we've seen at the show so far: Day one, day two. Click through to read the full recap, including TytoCare. Telehealth is beginning to mature as a viable arm of the healthcare industry, and it couldn’t be happening at a better time. When we talk about innovations in health care, we tend to focus on improving the patient experience through consumer-facing products and technologies. TytoCare, an Israeli-based telehealth company has raised $25 million led by Ping An Global Voyager Fund with participation from new and existing investors. TytoCare, a medtech company that developed connected devices to support telehealth, has closed a $25 million round of funding to support an expansion into China and build its customer base in the U.S. market, according to a company press release. A handful of digital stethoscopes that have secured FDA clearance are devices that seek to deepen the clinical data physicians collect from their patients but also make it easier to share that data for consults, second opinions, and remote monitoring. Host Mo Rocca shows us: the cargo carrier that follows you; the device that allows doctors to examine you from the other side of the world. Last week was the Consumer Electronics Show in Las Vegas. This is the show where companies tout their new inventions as well as their advancements in current products. iQor, a global leader in customer experience and managed services for many of the world’s leading brands, will announce a partnership with Israeli connected health start-up, TytoCare. Telehealth. It’s the hottest topic in the healthcare and technology sphere at this moment. Countless companies are attempting to jump on the bandwagon and it has almost become a race to see who can get their platform out to users first. One is a father who knew there had to be a way to remotely diagnose his daughter’s chronic ear infections. Another is a metropolitan healthcare system expanding its reach through virtual care. Allied Physicians Group, based in Melville, NY, announced today that they have signed an agreement with Tyto Care, a telehealth company with breakthrough technology for conducting remote medical exams and telehealth visits, to offer Tyto Care’s remote examination tool and platform to its patients for more convenient, timely and productive access to Allied physicians. Tyto Care, a telehealth company with breakthrough technology for conducting remote medical visits and examinations, has won the top distinction in this year’s iF DESIGN AWARD, the iF Gold Award, for its consumer product TytoHome. Parents around the world will recognise the perennial problem of taking their child to the doctor for relatively minor ailments simply to get prescription or medication. It didn’t take long for Dr. Dennis Truong to assess that his 27 year-old patient was sicker than she was letting on. Reporting on the coolest products at CES 2017 was an eye-opening glimpse into the future and confirmation that technology is going to continue impacting every part of our lives. As usual, CES 2017 was a four-day extravaganza of innovations from the smartest connected car innovations to the latest bendable/flexible battery. CES 2017 included almost four thousand exhibitors, literally hundreds of thousands of products, and exhibit space equal to more than 30 football fields. Picking a handful of products from this overwhelming display was a daunting task. CES provides a first glimpse at the future. Pretty much all of the tech giants attend the vast Vegas expo – either to unveil new products or to clinch deals behind the scene. When flu season hits, and you or your loved one feel something coming on, you would usually drag yourself out of bed, call your doctor to schedule an appointment, drive to the hospital and sit in a waiting room. Dedi Gilad, Tyto Care CEO and Co-Founder, demonstrates TytoCare at the CES Unveiled NYC Live Show and provides an overview of Tyto Care’s mission and vision for making comprehensive telehealth exams and available anytime and anywhere. There has been a good deal of activity in the world of telehealth in the past couple of weeks. American Well inked a deal with Tyto Care. Austin-based Medici Founder Clinton Phillips, who previously led 2nd.MD, raised $24 million to support the company’s expansion. TytoCare Ltd., an emerging Israel-based telehealth company has closed $11 million in Series B funding led by Cambia Health Solutions. 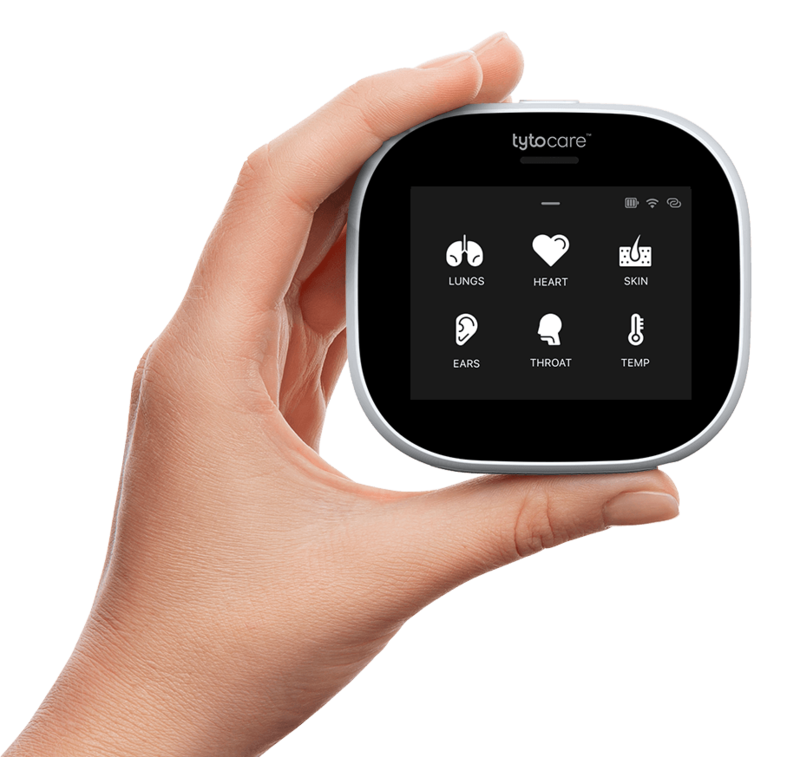 NEW YORK–(BUSINESS WIRE)–Tyto Care Inc. announced today that the U.S. Food and Drug Administration (FDA) has granted 510(k) clearance for its digital stethoscope, a device that will be part of its advanced set of examination tools now being introduced to the world of telehealth. Recognising the 100 most innovative mobile, digital and connected healthcare companies in the World today!